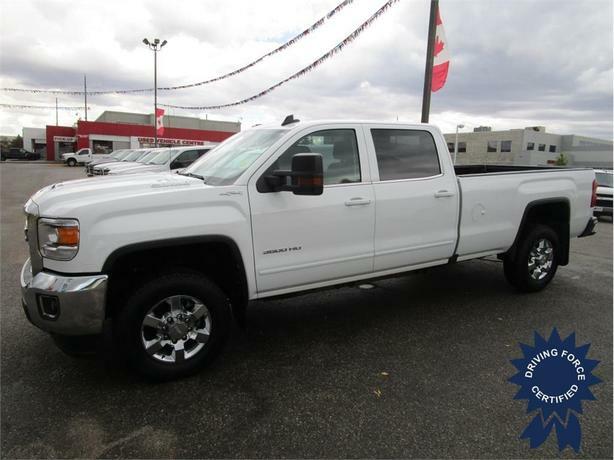 Ready to work or play this 2017 GMC Sierra 3500HD SLE Crew Cab Diesel 4WD Long Box is up for the job. Features include an 8-foot long box with spray-in bed liner, LP5 Duramax Diesel engine with 910 pound-feet of torque, pullout tow mirrors with LED spotlights, large 8 inch touch screen w/backup camera, 10-way power driver's seat, remote engine start, dual-zone climate control, Bluetooth hands-free calling, integrated trailer brake controller, steering wheel audio controls, 40/20/40 folding bench cloth seat allowing up to 6 passengers, easy clean rubberized-vinyl floor, AppleCar Play/Android Auto, 18 inch chrome alloy wheels, push button exhaust brake, mud flaps, keyless entry, chrome wheels, fog lights and more. This truck also comes with two sets of keys, balance of factory Chevrolet warranty, and has been certified to our high standards. Call or email one of our diesel truck sales consultants in Calgary today and experience the DRIVING FORCE difference.